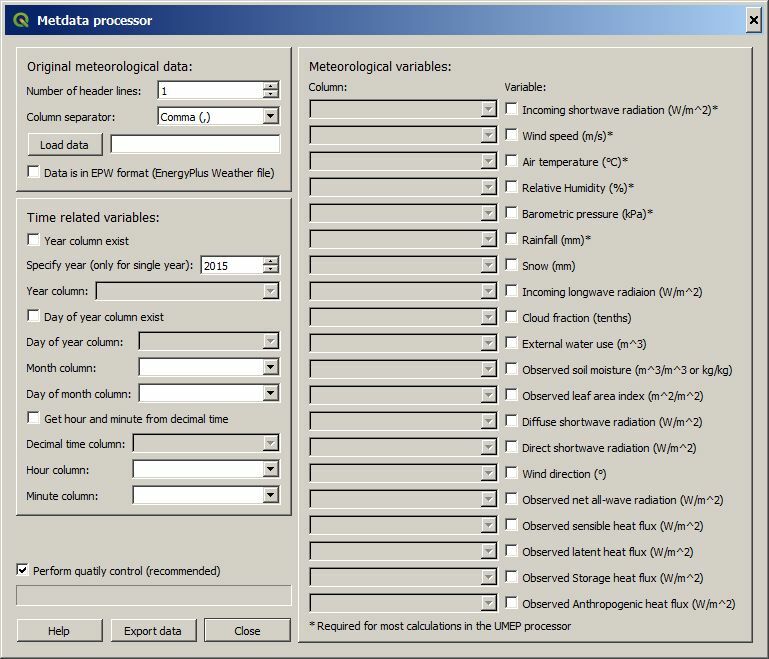 MetPreprocessor can be used to transform required temporal meteorological data into the format used in UMEP. The following variables are usually required as a minimum: air temperature, relative humidity, barometric pressure, wind speed, incoming shortwave radiation and rainfall; if available, other variables can be supplied as well. Input data can include any number of header lines and should be separated by conventional separators (e.g. comma, space, tab, etc). The output format is space-separated and includes time-related variables of year, day of year, hour and minute. The plugin is able to process other input time formats including month, day of month, etc. Possibility to use an EnergyPlus Weather (.epw) is also available. Note that .epw-files rarely have precipitation data included. This is is required for SUEWS-modelling and need to be acquired from elsewhere (external dataset). top left Select an existing text file with meteorological data at a temporal resolution between 5 min and 180 min (3 hours) that is divisible by 5 min. Tick in EPW box to convert an EnergyPlus Weather file. middle left Specify time-related columns in the imported data file. Select to perform a simple quality control which will check the input data for unreasonable values of each variable. right Choose columns from imported data file that correspond to the meteorological variables used in UMEP. 23 kdir Direct shortwave radiation [W m-2] 0 to 1200 Should be perpendicular to the Sun beam. One way to check this is to compare direct and global radiation and see if kdir is higher than global radiation during clear weather. Then kdir is measured perpendicular to the solar beam. If decimal time is ticked in, day of year column must be stated and the decimal time column should be numbers between 0 and 1. If you have problems with importing a dataset. Do a time series plot using small points. Check (1) are there any data gaps (there can be no gaps) (2) are the columns lined up throughout the data setes (e.g if variable suddenly changes incorrectly, you may have columns misaligned).